The how-to guide to becoming a go-to expert. Within their fields, thought leaders are sources of inspiration and innovation. They have the gift of harnessing their expertise and their networks to make their innovative thoughts real and replicable, sparking sustainable change and even creating movements around their ideas. 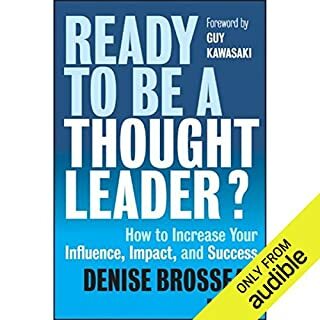 In Ready to Be a Thought Leader?, renowned executive talent agent Denise Brosseau tells listeners how to develop and use that gift as she maps the path from successful executive, professional, or civic leader to respected thought leader. Would you try another book from Denise Brosseau and Guy Kawasaki (foreword) and/or Kristin Kalbli and Vince Canlas ? In the beginning it is difficult to stay interested, but you convince yourself to give it a chance. Once you've given it a chance, you wish you had followed your initial instinct. Maybe it's just me, but it seems that the author(s) are trying to justify their sources. Each time a new source is mentioned, their resumes follow.I wish the authors had just given the lessons and moved on. It is difficult to stay focused on whatever point is trying to be made. What could Denise Brosseau and Guy Kawasaki (foreword) have done to make this a more enjoyable book for you? Get to the point. Approach the subjects in a more direct way. Way too convoluted. It constantly seems to prattle on. I have never written a book or have I been a book editor. My critique may have been too harsh. In all fairness, give it a try. Thankfully Audible allows their customers to return the books, (Which I plan to do with this one). Eh.... I wouldn't recommend it. 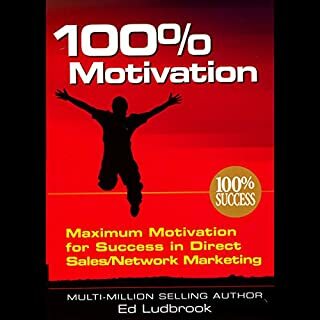 Has 100% Motivation turned you off from other books in this genre? Would you be willing to try another one of Ed Ludbrook’s performances? I'm sure it may have. I just couldn't stick with it long enough to hear any. None that would be productive.